Her 28 instant prizes, and another two dozen claimed by friends, suggest they bought 100,000 high-priced tickets. Joan Ginther, who won millions four times playing Texas lottery games, as she appeared in the 1969 University of Texas yearbook. 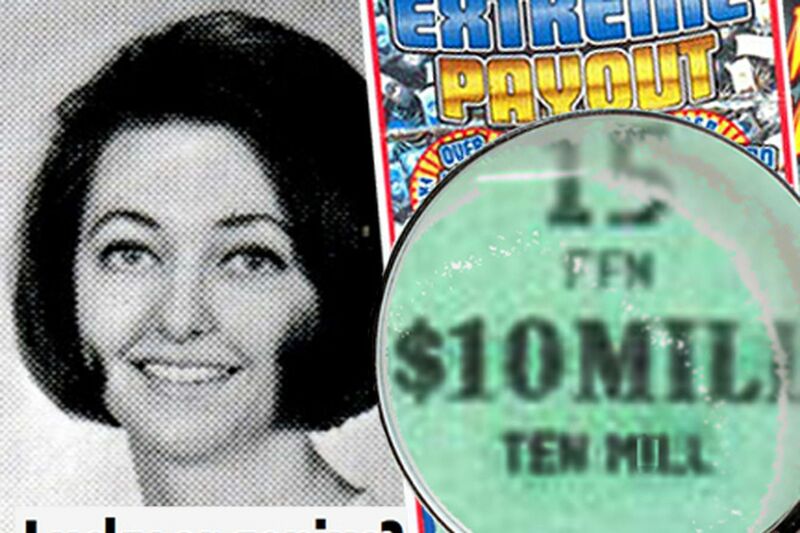 The "$10MILL" is magnified from a copy of her winning $10 million ticket. For years, people who dream of beating the lottery have puzzled over the amazing case of Joan Ginther, who made headlines around the world by scratching off "10MILL" on a $50 instant ticket in June 2010 to win her fourth multimillion-dollar prize. Skeptics wondered if she cheated or had an ingenious system for pinpointing winners. After all, Ginther received a Ph.D. from Stanford and has lived for years in Las Vegas. News reports at the time, citing mathematicians, fueled the fire: They put Ginther's chances of four such wins at 1 in 18 septillion. Remarkably, all four of her winners were purchased in or near her tiny hometown of Bishop, Texas. The mystery has only deepened since then because Ginther, now 67, has steadfastly refused to grant interviews, and the Texas Lottery has never investigated, insisting they never even asked Ginther how she won. Finally, answers have been found. The numbers go up even higher -- up to $3.3 million -- with the discovery that Ginther may have been working with a friend. As preposterous as those estimates sound, they're not unthinkable. If one ticket takes 90 seconds to scratch, that's 40 tickets an hour, making it feasible to knock off a thousand in a week, tens of thousands in a year. And that's without enlisting friends or improvising shortcuts, like scratching just enough for a retailer's scanner to read. Bishop residents themselves estimated Ginther bought several thousand tickets a year, and even monopolized select games with a retailer's help, according to "The Luckiest Woman on Earth," Nathaniel Rich's investigation of the mystery for Harper's magazine in 2011. See: "Joan Ginther well-known for buying tons of tickets"
Indeed, Times Market in Bishop sold $469,000 worth of tickets -- by far the most in all of Texas -- just for a game with $50 tickets called $140,000,000 Extreme Payout, the scratch-off that won Ginther $10 million in 2010. As for financing, believe it or not, it was possible for Joan Ginther to pay 25 cents on the dollar for tickets in Texas' high-priced scratch-off games, partly thanks to help from Uncle Sam. Part Two of this series, will explain that, while showing the odds she often beat were far more favorable than is commonly thought. Part Three will take a crack at predicting where a missing $7.5 million ticket is likely to be found in a current Texas scratch-off game. Pure luck explains her first big win, in 1993, when she claimed half of a Lotto Texas jackpot, securing a $5.4 million annuity payable in 20 annual installments. To beat a lottery drawing, you either need to rig the game (as in the Triple Six Fix in Pennsylvania that inspired the movie Lucky Numbers) or buy vast quantities of tickets when the jackpot is extraordinarily high (as in Stefan Mandel's syndicate to win a $27 million Virginia Lotto jackpot in 1992) or when the prize structure becomes favorable (as repeatedly happened with Massachusetts' Cash WinFall from 2005 to 2012). Joan Ginther's jackpot wasn't unusually large, and there's no evidence she bought huge numbers of Lotto Texas tickets. If she had, she should have won a fair share of smaller prizes, which would have triggered a paper trail since any amount of $600 or more has to be claimed at a lottery office for federal income-tax purposes. Right-to-know requests to the Texas Lottery turned up only one other prize awarded to a Ginther that year: $2,451 to her father, Clarke Ginther, in November for a Cash Five win. That fits a widespread rumor that he bought the winning Lotto Texas ticket at the Bishop Stop N Shop then gave it to his daughter because he was 78. Still, he lived to be 92. Joan Ginther was vacationing in the Virgin Islands when her father won, a Bishop resident told Rich for the Harper's article. One more clue that points to luck: Because people like to play dates and birthdays, we checked and found a match. Her winning Texas numbers were 1, 4, 7, 10, 47 and her birthday is 4/1/47. Maybe Joan Ginther was born under a lucky star. Maybe feeling lucky is why she moved to Las Vegas in 2001 -- and kept coming back to Texas to play the lottery. Nobody doubts she bought her three big scratch-off winners. In 2006, she hit for $2 million playing Holiday Millionaire, a $30 game. In 2008, she won $3 million in Millions & Millions, another $30 game. Then in 2010, she played North America's first game with a $10 million instant prize and found the second grand prize. Total: $15 million cash from scratch-offs, on top of the $5.4 million annuity from the 1993 drawing. An average scenario for scoring 28 reportable wins is purchasing more than 80,000 tickets costing more than $2.5 million, according to two statistics experts. "She was either up to something or she bought way more than $1.7 million worth of tickets," said mathematician Skip Garibaldi, who holds positions with Emory University and UCLA. That was before another discovery made the possibilities balloon. Joan Ginther wasn't the only woman from Bishop to claim a remarkable number of scratch-off prizes. We do know it was a case of friendship. Joan Ginther "paid for an extension to the house of her best friend, Anna-Linda Morales," Rich wrote in "The Luckiest Woman on Earth." The claims data clearly shows two women in sync. -- On Jan. 23, 2009, Anna Morales claimed her first $1,000 win, from a $20 game called Texas $50 Million Club. Prizes worth $600 or more have to be claimed at one of the lottery's regional offices, and the nearest office was in Corpus Christi, about 30 miles from Bishop. -- On the same day, Ginther claimed $2,000 in Millions & Millions. -- On Feb. 12, Morales claimed her second $1,000 in Texas $50 Million Club, and Ginther claimed another $2,000 in Millions & Millions. -- On May 1, the same prizes, the same games. -- Eight times in all, Ginther and Anna Morales claimed reportable prizes on the same day at the same lottery office, the one in Corpus Christi. The last time, on Feb. 12, 2012, they even claimed the same amount, $2,000, from the same game, Ultimate Casino Jackpot, with tickets purchased at the same store, Bishop Food Mart. Ginther also claimed a $1,000 prize from the same game that day, with a ticket bought at Adrian's Drive-In Grocery in Alice, a nearby town. There was even synchronicity in when the prizes stopped. Not a single claim was made by Ginther or Morales after 2012, the year Ginther collected the last $270,000 installment of her Lotto Texas annuity. If Joan Ginther bankrolled Morales' wins -- perhaps giving the winning tickets as gifts, or rewarding her friend for picking up and scratching off tickets -- estimates for Ginther's purchases would soar to 100,000 tickets worth a flabbergasting $3 million or more, according to Garibaldi and a lottery industry analyst who declined to be named. See: "Lottery teamwork: What's allowed by law?" In the game Extreme Payout, Ginther and Morales claimed 16 prizes, which fits the idea that, jointly or independently, they acquired all 9,380 tickets sold at Times Market, judging from the industry analyst's calculations. And their 16 wins in the game called Ultimate Casino Jackpot, purchased at five stores, suggest nearly 10,000 tickets bought at a cost of nearly $500,000 over three years. Sales figures easily support this number as well. Apparently, Ginther went full-out to win a fifth time, since this ticket-spending spree came after Ginther's $10 million win. On the other hand, sales figures were unavailable for some earlier games. A more conservative estimate for several might drop the possible Ginther-Morales shopping spree to 72,000 tickets and $2.4 million. Massive ticket buying, whatever the level, takes the steam out of most of the mysteries. Unless she was spending vast sums to mislead any potential investigations, she didn't know exactly when winning tickets would show up. Nor did she need to, apparently. Rather than tracking tickets down, she basically made tickets come to her. Only a portion of each game's tickets gets distributed to all 17,000 lottery retailers in Texas. Most tickets are held back, not only because demand is tough to predict, but because shipping them all at once would create a huge financial risk. Every top prize could get hit the first week, forcing the game to close and costing the state millions. A computerized system tracks "packs" or "books" of tickets being activated and prizes being cashed. When a store's stock gets low, tickets get shipped automatically, usually by UPS. Retailers can also place orders. So after the first round of shipments, it turns out winning tickets are most likely to show up at the store with the highest sales. By a wide margin, that store was Times Market. During one week in October 2009, the tiny store with a couple gas pumps got one-fifth of all the tickets shipped for Extreme Payout. For the game, the odds of a winner winding up there were about 1 in 128. Purchases at other stores, of course, would mean even better odds. Massive buying goes a long way toward explaining how Ginther won. She could still have had some kind of secret edge, though many of the usual suspicions -- like cracking the lottery code or using inside help -- don't seem to apply to her. Clearly, she was far from the luckiest woman on Earth. But was she out of her mind to buy so many tickets? It appears she knew exactly what she was doing. Part 2: "How lottery legend Joan Ginther likely used odds, Uncle Sam to win millions"
Part 3: "Lottery mystery yields clues to missing $7.5 million prize"